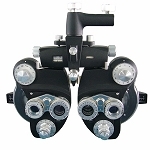 Typically, the patient sits behind the phoropter, and looks through it at an eye chart. This eye chart can be at optical infinity (6 meters), or at near (40 centimeters) for individuals needing reading glasses. The doctor then changes lenses and other settings, while asking the patient for subjective feedback on which settings gave the best vision.